Blague de Brett: Oh Deer! 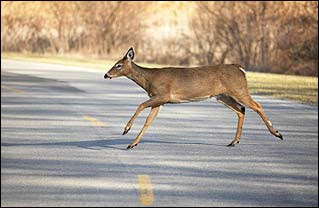 Maybe all of the deer that I'm always seeing are trying to tell me something...(thought bubble.) I thought I was doing a pretty good job on my Christian Journey but God wants us to be great. You really get me thinkin Brett. P.S. Since when 180 miles a quick journey? Ladies: I just think we always need to be challenged and should never just sit back and be comfortable. I've often said that God's will for our lives is usually not where we currently are...He always is pulling us to new heights of service and dedication. Raylen: Ask your dad if you can ride with me and I'll show you!